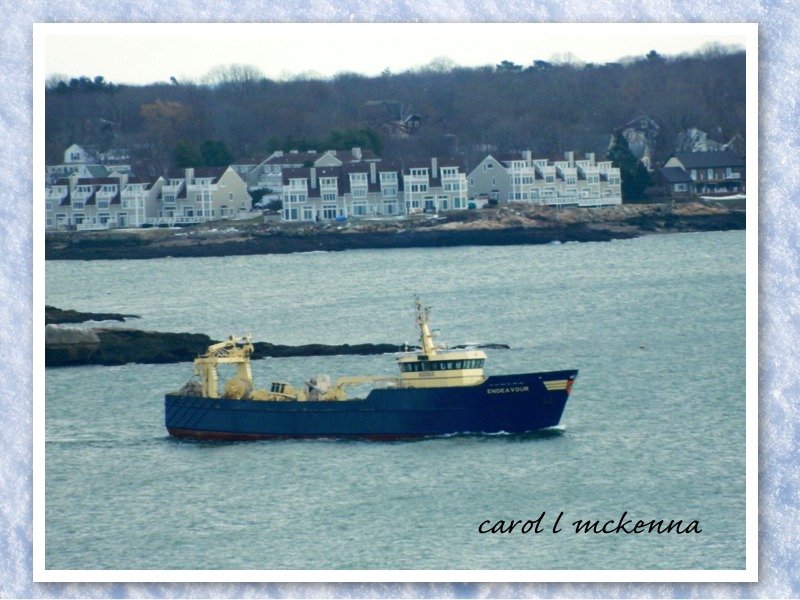 Welcome to Monday Post on A Creative Harbor where we are sharing some art creations, photography and haiku (Japanese poetry). I create from the eyes and heart of my artist soul. From the first time as a young child being introduced to art, photography and poetry, my heart seem to sing with a feeling of 'ah' this feels so good. To this day when creating and after creating (provided I get out of my own way and allow it to flow) my mind and body feel rejuvenated with the life force that we all have. I feel loved. Creativity. Wishing you best in the day. 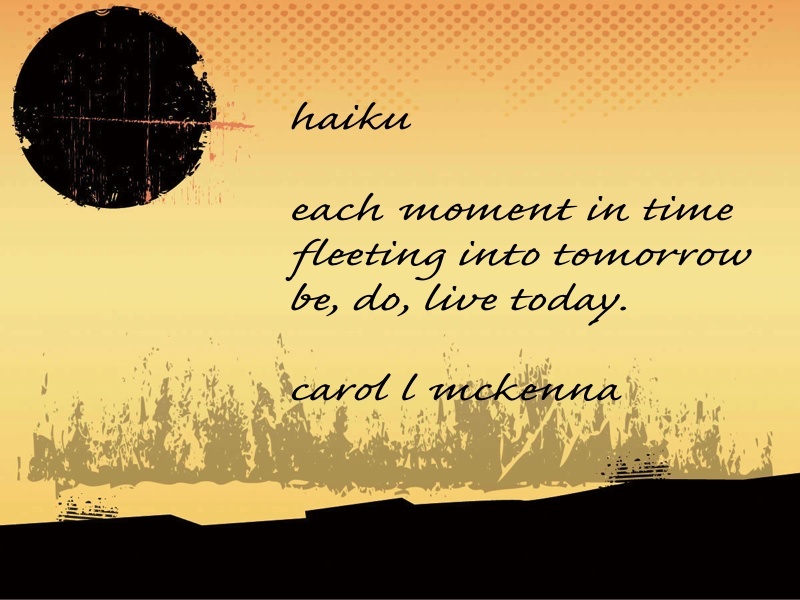 Nice haiku on 'tomorrow' Carol. A wonderful post, very nice photos. beautiful haiku. I especially love the artwork for that haiga. Such an encouraging haiku. I really like the mixed media piece. She looks so serene yet lively. Great post, Carol! That mixed media collage is absolutely wonderful! "Carpe Diem" as a haiku. Elegant and fine mixed media collages, Carol. Your haiku is full of courage, well done! Blogger is finally letting me post comments again! Beautiful work, Carol! We should all do things that make us go "ah!". ;) Happy Monday! 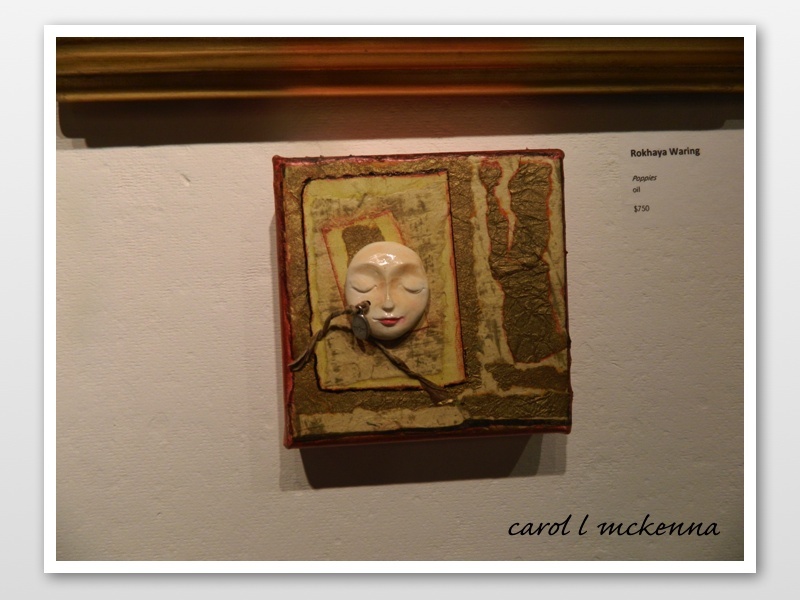 I liked the mixed media collage very much. Very creative works! Art Muse Dog is too cute Carol! Enjoyed all of the pics, but love the blue boat for Blue Monday! Yes, another great collage - nice haiku with deep thought. I always enjoy your Monday compilation of creativity. Thank-you! Thanks for sharing your thoughts and your beautiful blues. 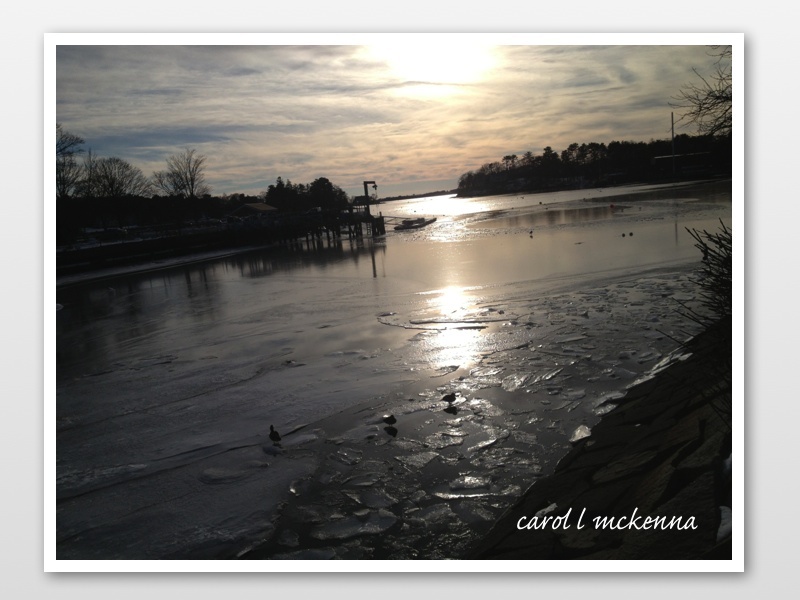 I love the picture with the ducks and ice. Love Mondays at your place! You live in such a beautiful place... the ocean shore seems to foster creativity! Delightful, Carol. Love the haiku and your art, as always, is lovely.... and inspiring! Thanks for commenting on my CED blog post, too! delightful haiga (? )....the last photo is sublime! 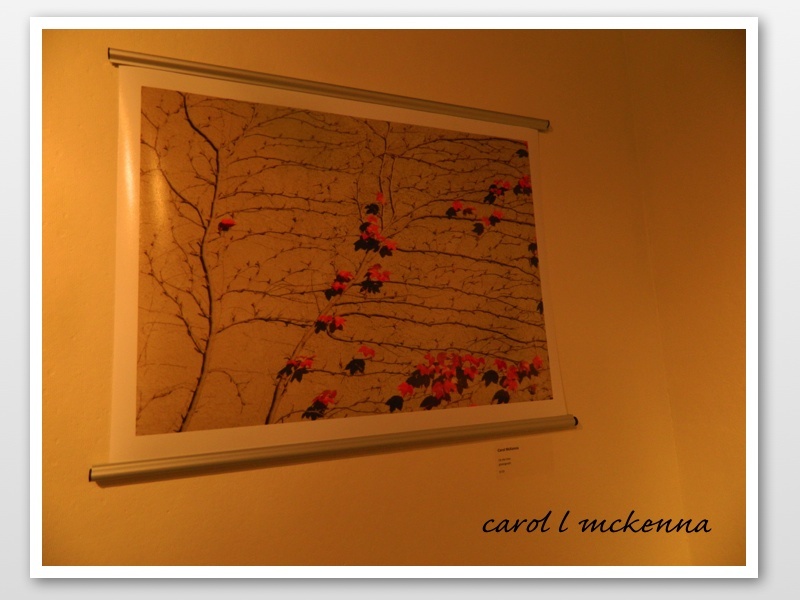 Hi Carol, Wonderful work, good luck with your show. It was nice seeing you on google! Thanks for following I am doing the same. Beautiful blue hues in your first photo! Your mixed media collage is wonderfully creative! And love the silvered glow in the last photo! Great photo of the charming seaside village and large ship embarking on a journey! Being, doing and living today is so hard for me! What a beautiful collage of art, images, and poetry. Thanks for sharing. Beautiful images and inspiring Haiku. Thank you. The painting was so lovely ! I liked the haiku for "today"
Oh boy, it's Thursday already but I am now just getting around with BLUE entries. Please leave me a line or two in my BLUE, thanks.